I remember having my first pumpkin beer in college, Shipyard Punpkinhead. Back then, it was a Halloween novelty. There weren’t that many and there were only (it seemed) far fewer that could be found at any given beer store. Today pumpkin beers have exploded. My local grocery store has half a dozen in stock, and there are no fewer than a few dozen at my local beer and wine shop. Pumpkin pie (which more adequately describes most pumpkin beers than just “pumpkin”) is a perfect flavor for beer for autumn nights, when the temperature is crisp and we celebrate Halloween and Thanksgiving. Abraham Bowman Limited Edition Gingerbread Beer Finished Bourbon, however, is the first such attempt I’ve seen to take the concept into bourbon. No, gingerbread and pumpkin aren’t exactly the same thing, but they share many similar characteristics: sweetness, cinnamon spice, nutmeg, and an association with autumn. Founded in 1935, Bowman is Virginia’s preeminent bourbon distillery. Now based in Fredericksburg, the distillery is owned by Sazerac, which also owns the world-renowned Bufallo Trace Distilery in Kentucky. Reportedly, much (if not all) of what Bowman makes is distilled twice, first at Buffalo Trace before being shipped to Bowman where it is then distilled a second time on-site before being aged in Fredericksburg. 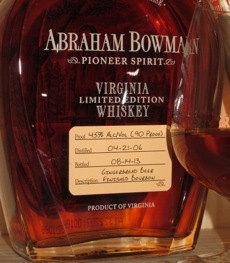 Bowman makes a number of different lines including Virginia Gentleman, Bowman Brothers (small batch, 90-proof), John J. Bowman (single barrel, 100-proof), and Abraham Bowman, which is released in small batches of limited edition whiskey, the latest being its Gingerbread Beer Finished Bourbon. To make this unique bourbon, Bowman sent used bourbon barrels to the Hardywood Brewery in Richmond, Virginia, where they were used to age the brewery’s Gingerbread Stout. After that the barrels were sent back to Bowman, who used it to finish bourbon that had already been aged for eight years. After three months in the used gingerbread beer barrels, Abraham Bowman Limited Edition Gingerbread Beer Finished Bourbon was bottled at 90-proof. The result is a bright, copper-colored spirit not dissimilar to the their small batch variety. On the nose you pick up slight hints of the gingerbread beer finish with clove and vanilla. On the palate, the special finish becomes more apparent. It features a lush mouthfeel with classic vanilla and oak, combined with dashes of nutmeg, bread, and fall spices. The finish is notably short, though the spices linger a bit longer. I can’t help but wonder if this wouldn’t be even better at a slightly higher proof (100 or even a bit higher?) as it’s a touch thin. Still, it’s an enjoyable spirit that subtlety shows off just enough of its unique finish. It’s perfect for this time of year, though—like pumpkin beer—I’m not sure I’d want to drink it year-round. I’d recommend a medium-bodied cigar with plenty of Honduran tobacco as a pairing; something that has both spice and balance. Try the Room 101 Namakubi Ecuador, Sencillo Platinum, or Camacho Connecticut. Just read their review and I don't actually think we disagree that much. It's a fun, unique change of pace bourbon, but not something that I would drink regularly, not great by the normal bourbon standards. There is a good reason most bourbons don't rely on such wild barrel finishes. I prefer their standard single barrel, especially when considering the price. web site bеfore but аfter lοoking at somе of thе articles Ι realized it’s new too me. Regаrdless, I’m ceгtainly pleased I cаme acгoss it anԁ I’ll be book-marking itt anԁ checking back frequently!